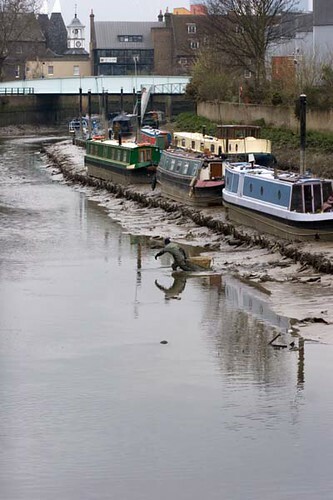 The narrow boats at Three Mills Mooring sit on the mud twice a day. This gives Brian and his son Darren at least four good hunting hours for the worms, that they sell for tropical fish food. Darren says cloudy days are ideal because the worms rise close to the surface so they don’t have to dig as deep. The boaters say they will miss hearing Brian and Darren swear at each other outside their windows as they rush to finish before the water rises again.